Spintronics is an emerging field in which the spin of electrons, rather than the charge, is used to process data. Unfortunately, the spin only lasts for a very short time, making it difficult to exploit in electronics. Researchers from the Kavli Institute of Nanoscience at TU Delft, working with the Netherlands Organisation for Scientific Research's AMOLF institute, have now found a way to convert spin information into a predictable light signal at room temperature. The discovery brings the worlds of spintronics and nanophotonics closer together and might lead to the development of an energy-efficient way of processing data, in data centres, for example. The researchers have given an account of their results in Science. The research involved a nano-construction consisting of two components: an extremely thin silver thread, and a 2-D material called tungsten disulfide. The researchers attached the silver thread to a slice of tungsten disulfide measuring just four atoms in thickness. Using circularly polarised light, they created what are known as 'excitons' with a specific rotational direction. The direction of that spin could be intitialized using the rotational direction of the laser light. Excitons are actually electrons that have bounced out of their orbit. With this technique, the laser beam ensures that the electrons are launched into a wider orbit around a positively charged hole in much the same way as a hydrogen atom. The excitons thus created want to return to their original state. On their return to the smaller orbit, they emit energy in the form of light. This light contains the spin information, but is emitted in all directions. To use the spin information, the Delft researchers returned to an earlier discovery. They had shown that when light moves along a nanowire, it is accompanied by a rotating electromagnetic field very close to the wire: It spins clockwise on one side of the wire, and anti-clockwise on the other side. When the light moves in the opposite direction, the spin directions change, too. So the local rotational direction of the electromagnetic field is locked one-to-one to the direction that the light travels along the wire. "We use this phenomenon as a type of lock combination," explains Kuipers. "An exciton with a particular rotational direction can only emit light along the thread if the two rotational directions correspond." A direct link is created between the spin information and the propagation direction of the light along the nanowire. It works almost perfectly: The spin information is 'launched' in the right direction along the thread in 90 percent of cases. In this way, fragile spin information can be carefully converted into a light signal and transported over far greater distances. Thanks to this technique, which works at room temperature, you can easily make new optoelectronic circuitry. Kuipers: "You don't need a stream of electrons, and no heat is released. This makes it a very low-energy way of transferring information." 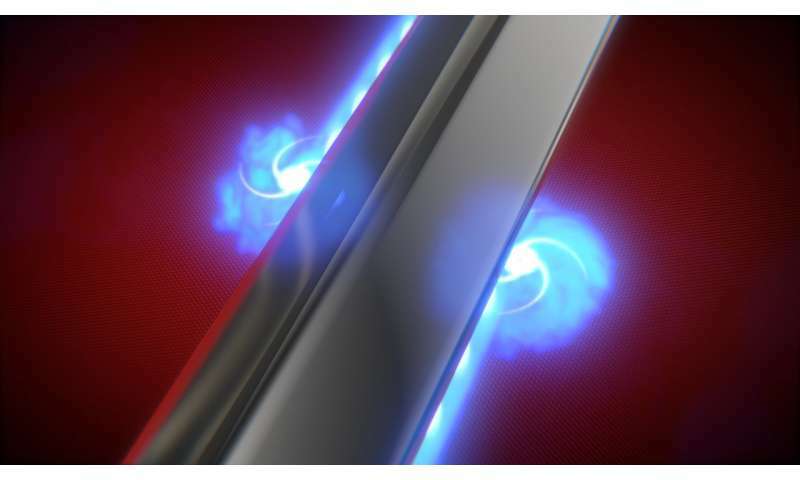 The discovery clears the way for combining the worlds of spintronics and nanophotonics. Kuipers: "This combination may well result in green information processing strategies at the nanoscale."